The details about the project are not revealed yet, but it will be quite interesting to see how Aanand pulls off the task of showing King Khan as a dwarf. “He has studied this and he knows how to execute it. SRK’s studio is also brainstorming with Rai on this,” added the source, as quoted by the tabloid. Now this one will be a really intriguing look to watch out for, what say? Shahrukh confirmed that he was in talk with both Anand L. Rai and Imtiaz Ali for their next as well as two other directors he has yet to name. Mumbai: Anand L Rai has not worked with any Bollywood biggies in past, but now when he has superstar Shah Rukh Khan on board for his next project, the filmmaker is thrilled and all geared up for it. The 44-year-old director, who is riding high on the success of his two consecutive films- "Raanjhanaa" and "Tanu Weds Manu: Returns," was all praise for SRK. "He is a gutsy actor. He always takes challenges. It is a delight to have him in the film. We both have liking for each other. We want to work together and we are on that process. "Shah Rukh is a very intelligent man. He makes you feel so important and responsible so it is fun to work with him. He was very happy to hear the story," Rai told PTI. The 50-year-old "Dilwale" star will be seen essaying the role of a dwarf in the interesting love story and the director is planning to serve a decent dose of songs in the film. "It (story) sounds it is just about dwarf but it is much more than that. It is a much taller film. It is a very entertaining and interesting love story. I will be fool if I have Shah Rukh Khan in my film and have no romance and songs," he said. The filmmaker is yet to finalise the lead actress for the movie. Apart from direction, Rai is excited about his upcoming projects as a producer. "We have Nil Battey Sannata' with Swara Bhaskar, Happy Bhaag Jayegi' starring Abhay Deol and Diana Penty and Manmarziyan' with Ayushmann Khurrana and Bhumi Pednekar. All three are interesting films and I am excited about it. This is the kind of cinema I want to be involved with as a producer. I am enjoying the process," he added. Sonam Kapoor and Deepika Padukone in Aanand L Rai’s next? It’s almost like a game of musical chairs when the question arises about the leading ladies in Aanand L Rai’s next with Shah Rukh Khan. While some said it’s Deepika Padukone and Katrina Kaif, some claimed its Deepika Padukone and Alia Bhatt. However today there’s a new name in the story. We hear it’s Sonam Kapoor who is being considered for the film. This will be the first time Shah Rukh Khan and Sonam Kapoor will be seen together and the coup will be to see Sonam Kapoor and Deepika Padukone in one frame. The two divas have always been at loggerheads and have been arch rivals and if the two agree for it, this one will be to watch out for. As of now we have to wait for an official announcement. After the success of January release Raees, Shah Rukh Khan will be returning to the big screen with Imtiaz Ali’s next, which is slated for an August 11, 2017 release. While we’ll be waiting for his upcoming romantic drama, Shah Rukh Khan will start the shoot of his next untitled project with Aanand L Rai, where he is essaying the role of a dwarf. The film is set in the city of Meerut in UP, but according to a report in mid-day, Shah Rukh Khan won’t be shooting the film in the city but will be bringing the city to Mumbai. Yes, the makers will be creating the set here in Mumbai. So no wonder makers decided to not risk the shoot. As far as female lead of the film is concerned, a spokesperson from Anand L Rai’s team clarified, “A lot of names have been thrown in but at the moment the female lead has not been finalised. The casting is underway and is taking time as it is a difficult role, in fact one of the most challenging that Aanand has ever worked on. The role needs a lot of prep time as well as shoot time for which a substantial chunk of dates are required. It’s not just about finishing this film but making it”. The superstar will shoot for his next at the theatre in Mumbai! Aanand L Rai has been scouting for a suitable theatre in Mumbai, for his next untitled film mainlining Shah Rukh Khan. After Hrs bumped into the director near Chandan cinema and asked him if he was there to catch SRK's latest release Jab Harry Met Sejal. He denied that adding he was there for a special reason'. 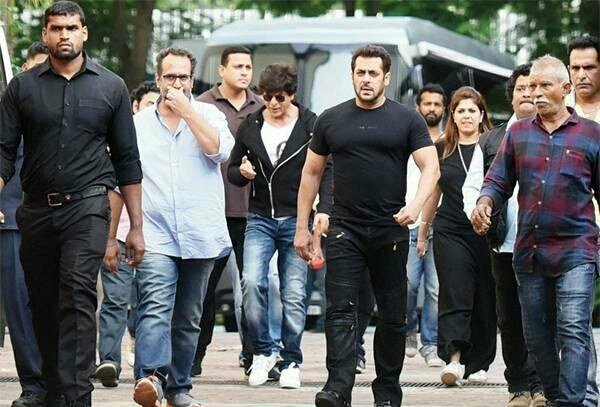 He revealed, "I am here because we are finalising Chandan as our location to shoot a special sequence of my film with Shah (Rukh Khan) sir. He told us about the sequence, "Shah sir's character comes to Chandan to watch a film in which Katrina (she plays an actress in the film) stars in. That's the whole scene. heatre to plan the shots. While Shah Rukh fans have always thronged the famous single screen theatre in Juhu to watch his films, this time, SRK will be a part of the audience. The second schedule of the film rolls in August and the Chandan shoot is a part of this shooting leg itself.